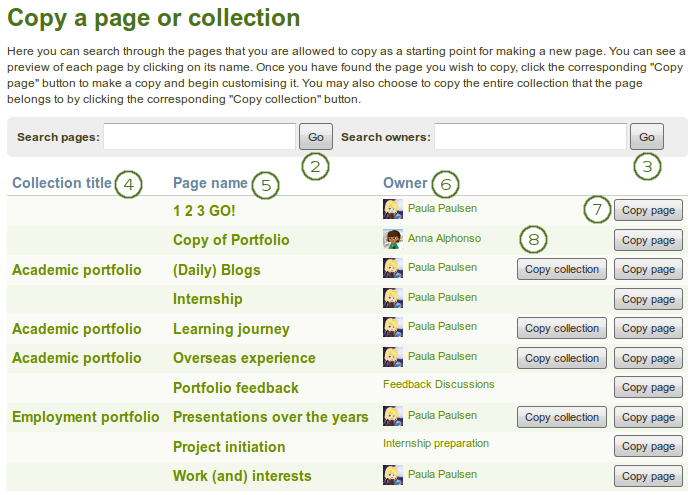 Search: Enter your search term and decide in which context you wish to search it for within your portfolio. Click the Search button to start your search. 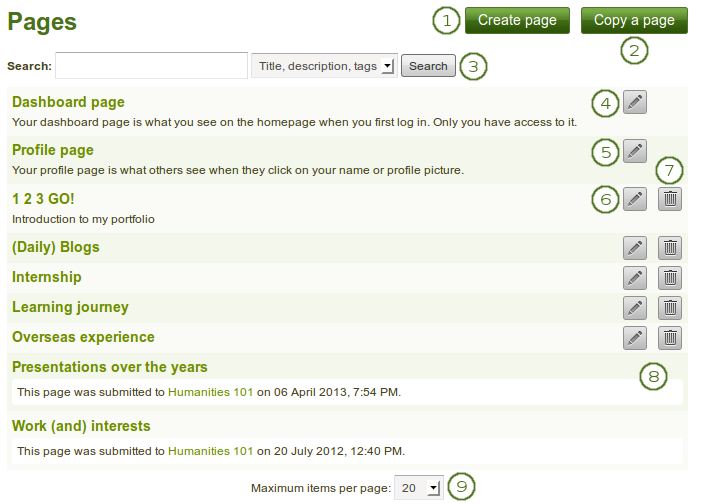 Click the Edit button to make changes to your dashboard page. You cannot delete your dashboard page. Click the Edit button to make changes to your profile page. You cannot delete your profile page. Click the Edit button to update your portfolio pages. Click the Delete button to remove your pages. 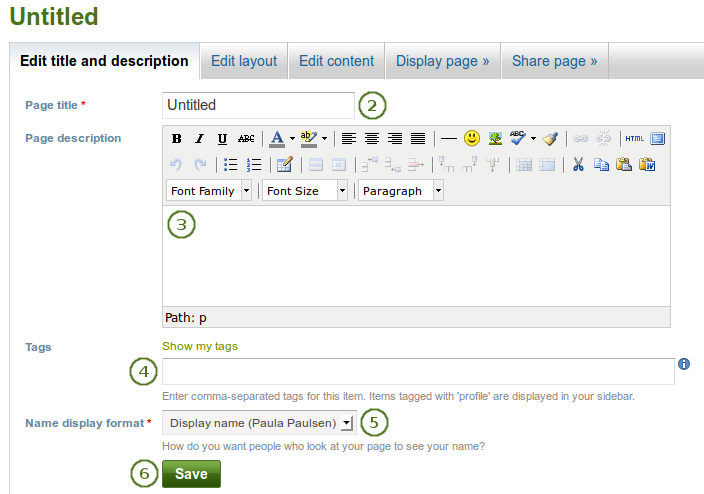 Name display format: Choose which of your names you want to appear on the page as author. 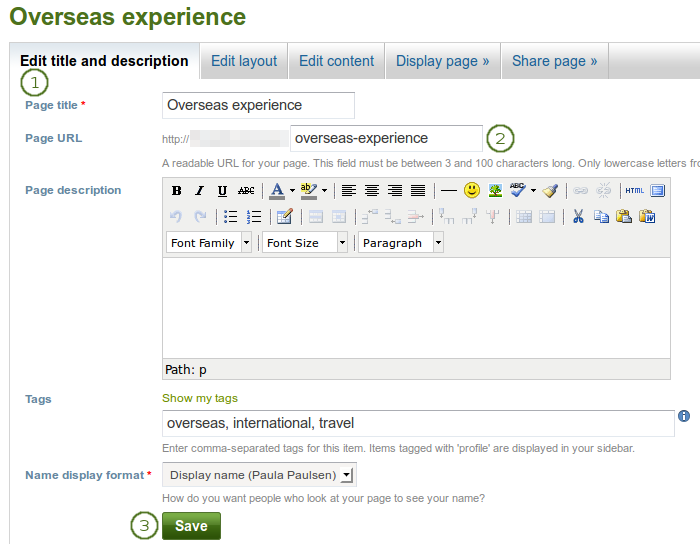 Click the Edit button when you are on the Pages overview page. Search owners: Search for the author of the page. This can be a user, a group or an institution. 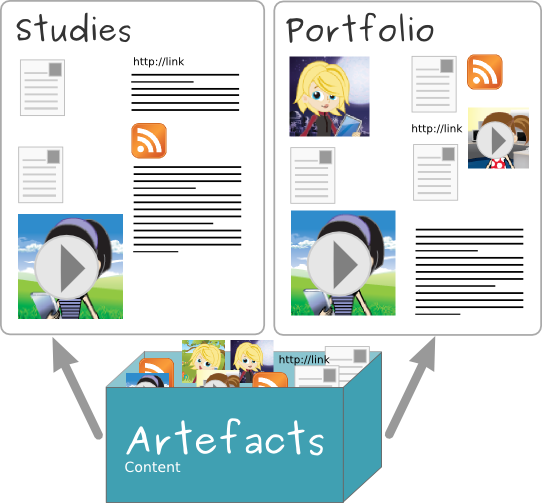 An example portfolio page. When you are the author, you can click the Edit button and make changes. The Edit this page button is only visible to you as portfolio author. 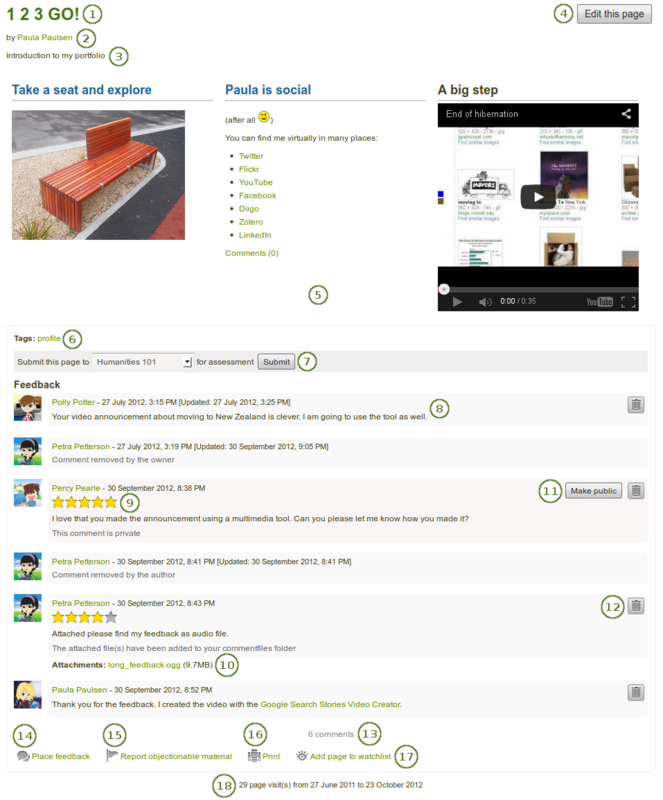 Your commentators can give a rating in addition to their verbal feedback if the site adminstrator enabled comment ratings. Your commentators can upload one or more files in addition to their verbal feedback, e.g. a file with inline comments, an audio or video file with feedback. If a comment is set to “private” by the comment author, you can decide to make it public by clicking the Make public button. You and the comment author can delete a comment by clicking the Delete button . The comment text is not displayed anymore, but a line is still visible where the old comment was so you know that you deleted a comment. In addition, if you delete the comment by someone else, they will receive a notification about it, which includes their comment text. You and others can use the Place feedback link to leave comments on the page. Please refer to the section on giving feedback to see how that can be done. If a page contains offensive artefacts, users can report them to the administrator by clicking the Report objectionable material link. Click the Print link to print the page. Click the Add page to watchlist link if you want to be informed when changes are made to the page. The collection of which the page is a part of is displayed, and you can use the link to view your collection.